All the fun of Escape, now with zombies! 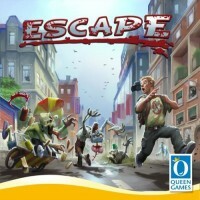 Escape: Zombie City is a real-time board game, where 2-4 players take their turns simultaneously by rolling their 5 dice as fast and as often as they can without waiting for their teammates. With the town created from randomly drawn street tiles, scenarios played from shuffled card sets, and zombies roaming the streets, Escape: Zombie City is always different - making for a fast and furious game experience every time! Coordinate your actions and help each other, because your only chance for survival against the zombies and escaping zombie city is by working as a team. Add a Review for "Escape: Zombie City"